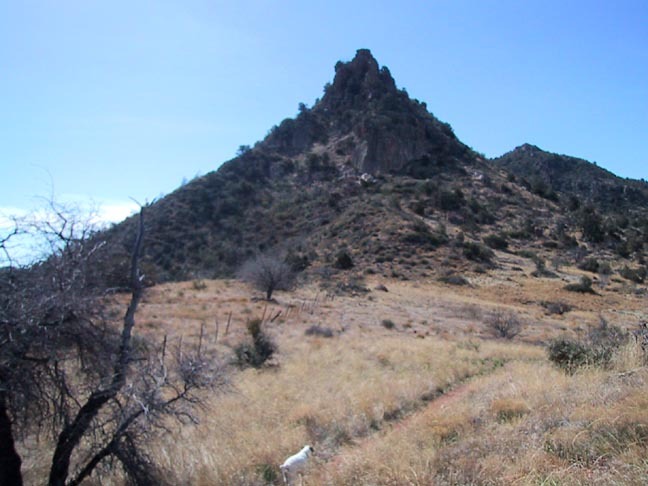 This out & back hike (14mi / 3030 aeg) from the far eastern edge of the Superstition Wilderness into Reavis Ranch starts from the Campaign Trailhead (formerly Upper Horrell). 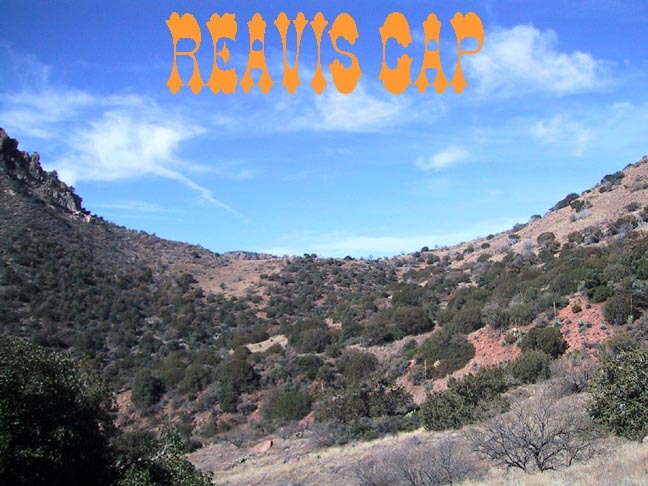 It starts on the Campaign Trail for a short distance then follows the Reavis Gap Trail all the way in to Reavis Ranch. 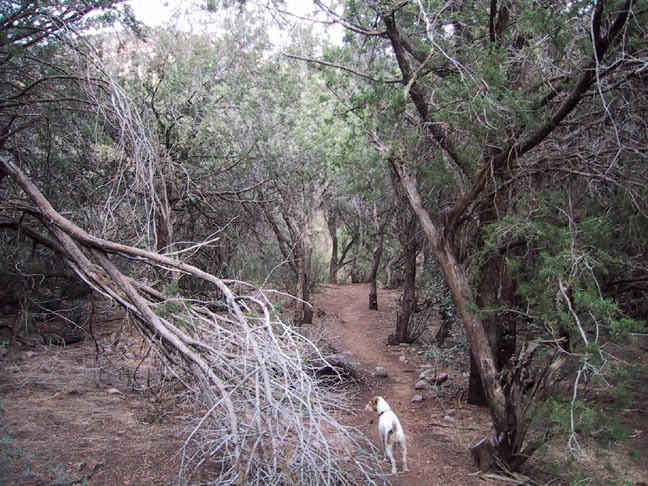 Although not the longest of the three routes into the Ranch, it may well be the most difficult. 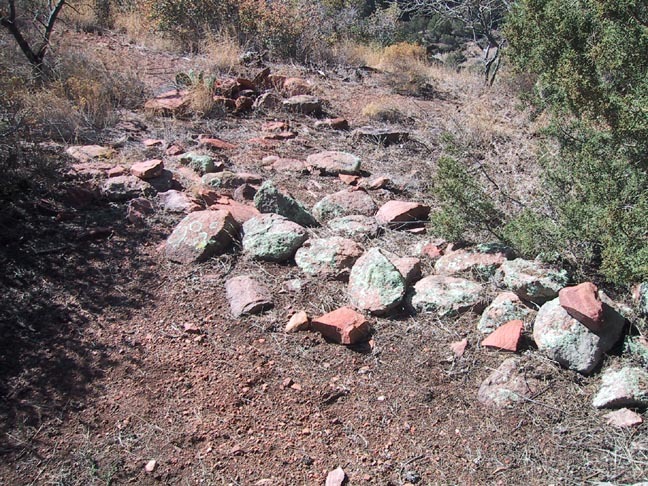 In addition to being predominately "up and down" with scarcely few flat sections, the trail is also inordinately rocky. From the parking area continue southwest about .2mi on the dirt road till you come to the signed start of the Campaign trail. The trail climbs the northwest side of Campaign Creek and offers some nice views of the "Reavis Mountain School" as you pass above it on your way back down to the creek bed. As you continue on toward the Reavis Gap trail intersection at 1.2mi you'll cross the vigorously flowing creek numerous times. 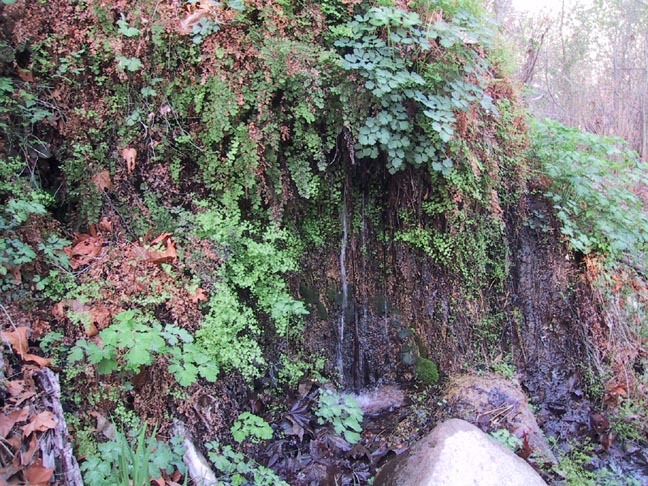 It may be noted that during this driest of years, the lower section of this creek was flowing much more than Reavis Creek itself. Once on the Gap trail you climb out of the lush bottoms and over to the dry, boulder strewn wash at the bottom of Reavis Gap Canyon (@1.75mi). From here it is a steady, if not grueling climb up to the Reavis Gap. 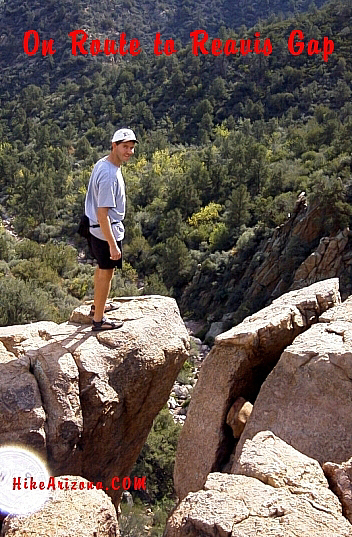 The trail follows high up on the north slope of the canyon. At several points along this route, ruins can be found that I'm told date back to the Salado Indians over a thousand years ago. They are overgrown and quite obscure, but with a little diligence one can pick out the remains of various stone circles and walls. 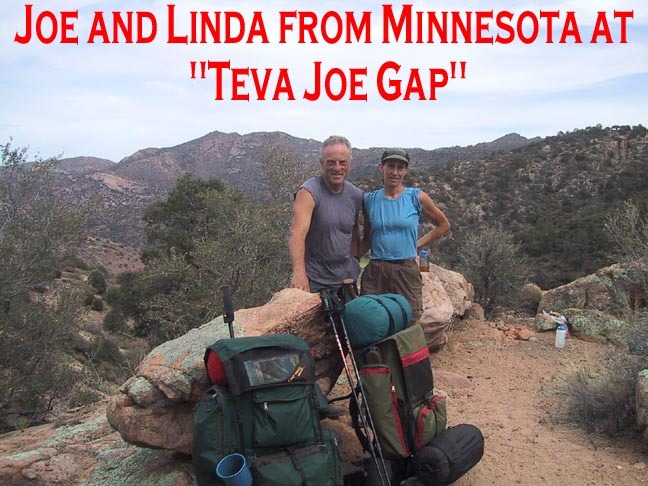 At about the two mile point you will come to "Teva Joe Gap", an overlook which is a natural resting spot, and one chosen by the only other folks I saw all day. The climb continues unabated all the way to the Gap and the nearby intersection with the Two Bar Ridge Trail (3.4mi). The grassy, open expanse of this area is very serene and one of the only relaxing sections of the hike. 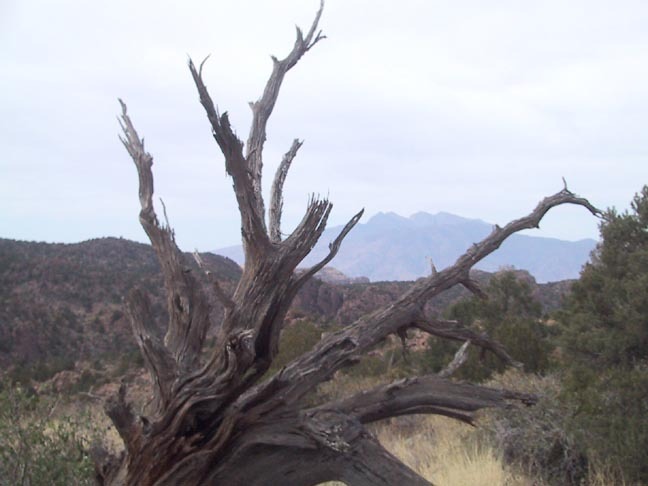 From here there are some nice views north down to the Salt River Canyon in the area of Roosevelt Dam and also out to Four Peaks. The climb actually continues a bit further till you finally descend into the Pine Creek drainage and cross it at 4.2mi. This spot has some nice shady campsites and water, although it was not flowing well. I call these "doggy pools" - he'll drink it, I won't. 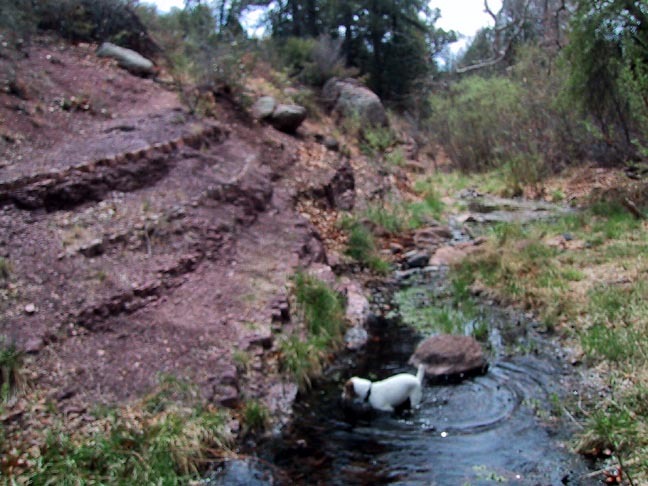 Hiking down stream in Pine Creek looked very tempting. Maybe a loop with the Two Bar trail for another day. Continuing on, the climb begins anew. This second push is a real grinder to the high point of the hike, which is a saddle east of Boulder Mountain at 5.5mi and 5350' elevation. From here it's all down hill to the Ranch with some great views of the valley below along the way. 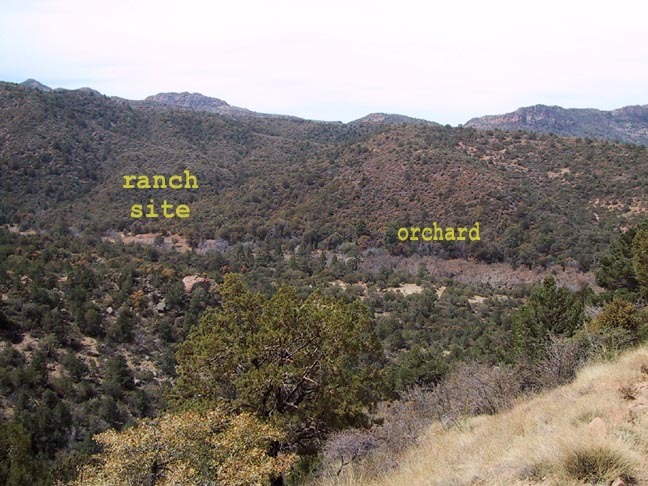 Once at the floor of the valley you'll cross Reavis Creek and enter the meadow at the north end of the orchard. Straight across is the Reavis Ranch Trail intersection at 6.8 miles. From here it's only a short walk of about .4 miles south to the old ranch site itself. 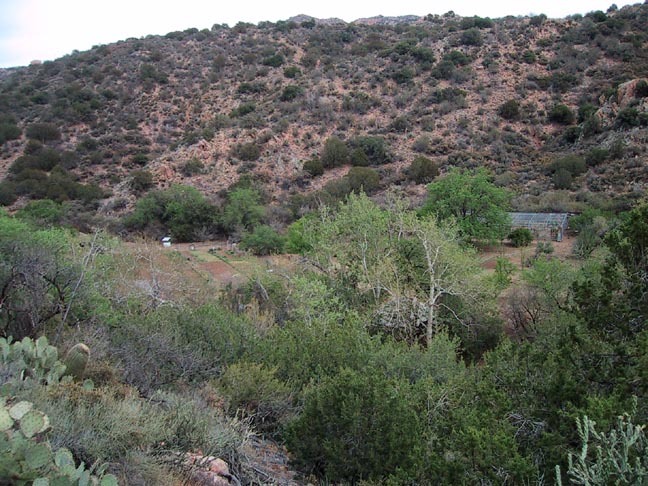 For more information and photos of the ranch and its surroundings reference the Reavis Ranch via 109 South hike in the HAZ TrailDex. Enjoy a nice lunch break or overnight in this scenic valley, and then when you're ready to return just reverse the route. From SR 188 turn off onto 449 (also called J-B) just past milepost 235 Follow 449 about two miles to the junction with Cross P Ranch. FR449A is located through the white fence to the left of the Ranch. FR449A is said to be possibly used by high clearance vehicles. I wouldn't recommend. There are some deep sections of sand as well as a couple creek crossings. This is no place to get stuck, no cell phone signal and a long day hike back to SR88. 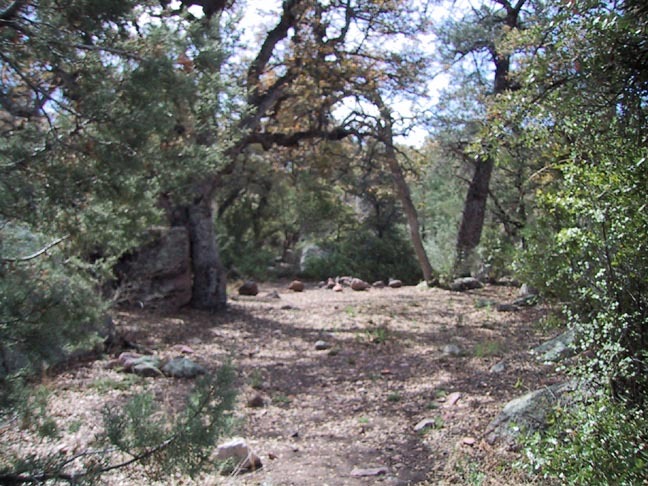 Follow FR449A about six miles to the Upper Horrell(Campaign) Trailhead parking. Along FR449A notice the awesome slot canyon passed along the way.